Well, if you can’t getaway, go to the library for a good book! The Utica, NY Public Library opened in 1904. I love the inside of this Library. The upper floors of the Utica Library are made of thick glass. I used to love coming here as a child. In every box of fabric we Island Batik Ambassador’s receive, there is a secret bundle of the newly released batiks. 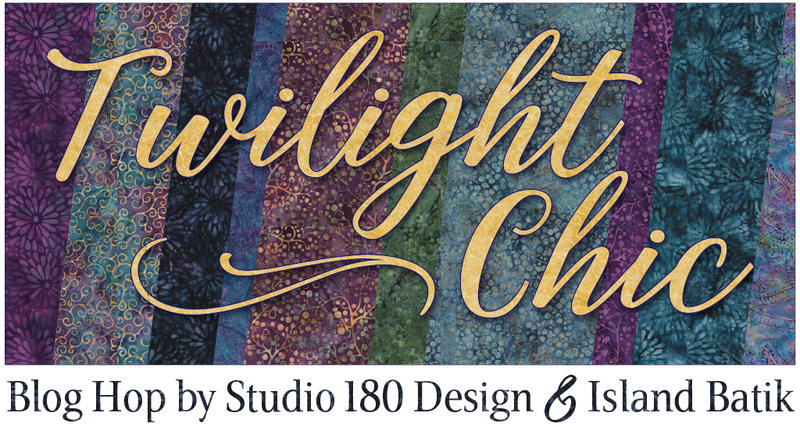 I was lucky enough to be assigned Twilight Chic by Deb Tucker for Studio 180 Design. This is my third quilt from the Twilight Chic line. Shaded Chic is based on BlockBuster # 35 Hidden Blossoms. Each block has 8 Shaded Four Patch units and 8 Sliver units. 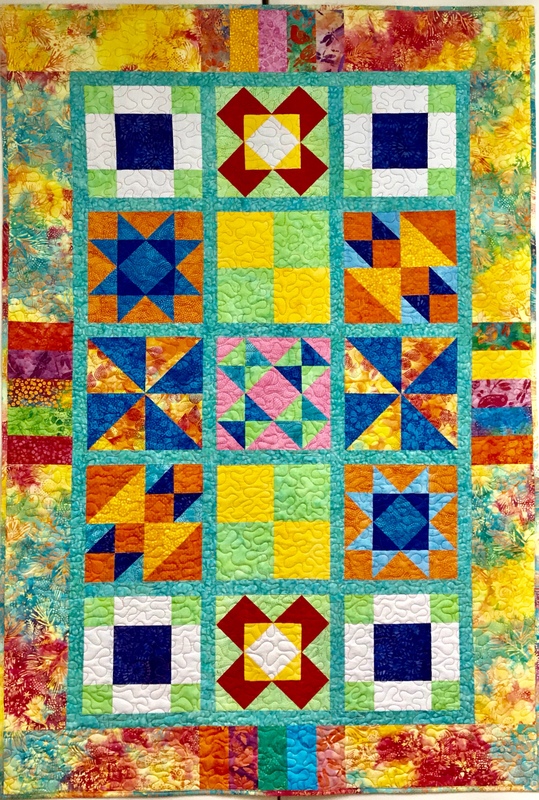 This block is made using Studio 180 Design’s Tucker Trimmer I & Corner Beam tools with the Shaded Four Patch & Sliver Technique Sheets. Shaded Chic consists of nine 12″ blocks and measures 50″ x 50″. 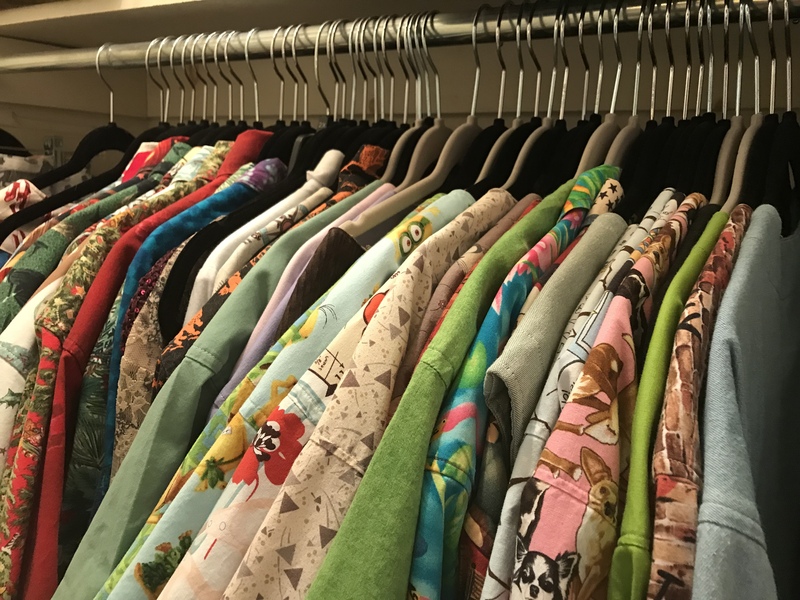 Be sure to visit Island Batik to enter their give away of 20 fat quarter bundle. Here is the list of all the ambassadors for this month-long hop! This entry was posted in BlockBuster's, Island Batik Ambassador, Island Batik Fabric, Island Batik Getaway Blog Hop, Shaded Four Patch, Sliver and tagged Corner Beam, Deb Tucker, Island Batik, Island Batik Ambassador, Island Batik Getaway Blog Hop, quilting, Quilts, Shaded Four Patch, Sliver Techinique, Studio 180 Design, Twilight Chic Fabrics on January 18, 2019 by ifthesethreadscouldtalk. The BlockBuster 2 – Crowning Glory block is very much like the Ohio Star Variation. Both use the Tucker Trimmer I, but the corner units are swapped out for the Shaded Four Patch units. All the instructions you need for this block can be found in the instructions that came with your Tucker Trimmer I tool and on the Shaded Four Patch Technique Sheet. Click here for the 02 Crowning Glory supply list. When making your shaded four patches, remember that the narrow strip is your small square and the wide strip becomes your little triangles, and the rectangle is the large triangle. I chose to make the middle block layout using 5 fabrics for a 12″ finished block. Color 1 – Background, cut 2 – 5″ x 6″ rectangles. Color 2 – Light Teal, wide strip, cut 1 – 3 3/4″ strip WOF ( if using a fat quarter, cut 2 strips). Cut 1 – 5 1/2″ square. Color 3 – Dark Teal, narrow strip, cut 1 – 2 3/4″ strip WOF ( if using a fat quarter, cut 2 strips). Cut 2 – 5 1/2″ squares. Color 4 – Gold, cut 1 – 5 1/2″ square. Color 5 – Red center square, cut 1 – 4 1/2″ square. Beginning with the shaded four patch units, cut 2 – 5″ x 6″ rectangles from Color 1 – Background. Cut 1 – 3 3/4″ strip from Color 2 – Light Teal. Cut 1 – 2 3/4″ strip from Color 3 – Dark Teal. Cut the wide & the narrow strips in half if you cut from WOF. Take one narrow strip and one wide strip and with right sides together, sew along one long side. Repeat with the other 2 strips. Press towards the wide strip. Trim the end and sub-cut into units the same width as the narrow strip, which is 2 3/4″. Because we only need 4 shaded four patch units, we only need to cut 2 pairs. Stitch each pair of cut pieces along one long side. Fold in half to find the center and snip to the seam line to aid in pressing. Position a ruler with a 45 degree angle on your unit as shown below. Draw a 45 degree sewing line from the top to bottom, through the corner of the square where the stitching lines meet. Center each marked unit over the rectangle. Sew on the lines, Cut apart and press toward the large triangle. Using your Tucker Trimmer I, trim to the cut size of 4 1/2″. Rotate the unit and trim again. You now have 4 shaded four patch units. As with the Ohio Star Variation we will be making 3 color quarter square triangles. I chose the dark teal as my star points. Following the instructions for my Tucker Trimmer for 4″ finished units, I cut 2 – 5 1/2″ starter squares of my color 3 dark teal, 1 – 5 1/2″ starter square of color 2 light teal. And 1 – 5 1/2″ starter square of color 4 gold. We start by making half square triangles. Using your Magic Wand, draw diagonal lines on the back of 2 of the starter squares. Position a color 2 light teal square over a color 3 dark teal square, and a color 4 gold square over the other color 3 dark teal square. Sew on the lines and cut apart. Press toward the dark triangle. Again, Using your Magic Wand draw diagonal sewing lines on the back of two half square triangles. Position one gold and dark teal half square triangle over one light teal and dark teal half square triangle making sure the dark teal is on opposite sides. Nest the seams carefully. Sew on the lines, cut apart, swirl the centers and press well. Repeat with the other two half square triangles. Trim to the cut size of 4 1/2″ using your Tucker Trimmer I. Rotate and trim Again. You now have 4 – 3 color quarter square triangles. Sew the 3 units on the right and press toward the shaded four patch units. Sew the center 3 units and press toward the center square. sew the 3 units on the left and press toward the shaded four patch units. Join the 3 sections, carefully nesting the seams and press. Below are Crowning Glory and the Ohio Star Variation side by side . They look so different for being so similar. 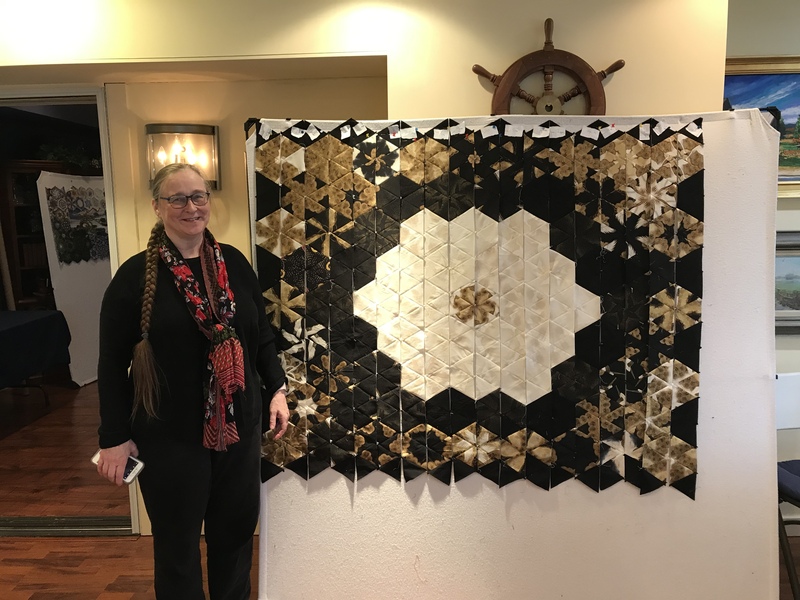 This entry was posted in BlockBuster's, Shaded Four Patch, Tucker Trimmer 1 and tagged BlockBuster's, Crowning Glory Block, Deb Tucker, quilting, Quilts, Shaded Four Patch, Studio 180 Design on June 1, 2017 by ifthesethreadscouldtalk. Tuckerization, to Tuckerize. V. The process of taking traditional quilt block instructions and applying process improvement techniques with Deb Tucker’s Studio 180 Tools! I taught a Shaded Four Patch workshop last month and have been slightly obsessed with them ever since. I keep looking for them everywhere. 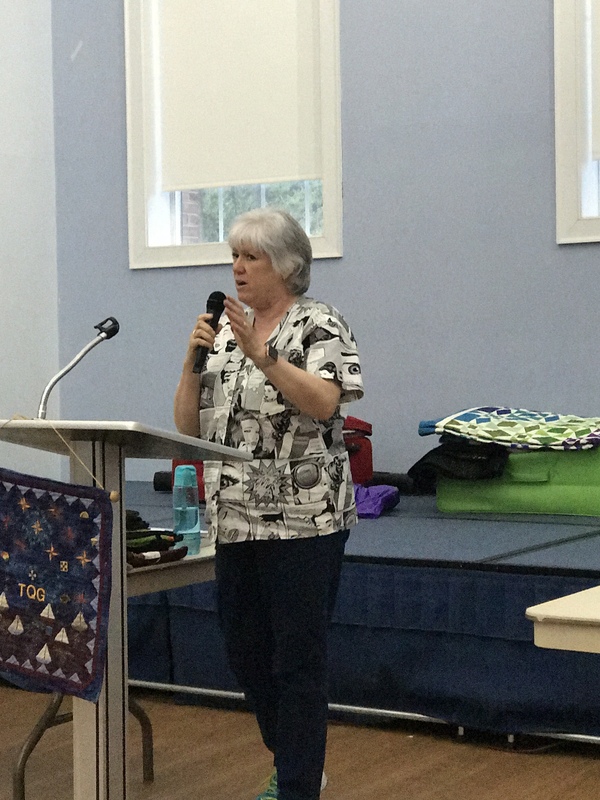 I was at a quilt retreat with some fellow Certified Instructors and one them showed me a book by Sally Schneider called “Scrap Quilts Fit for a Queen, or a King, Twin, or Lap”. There are some beautiful quilts in this book with layouts for King, Queen, Twin or Lap size (hence the title of the book). There are several quilts that contained the Shaded Four Patch Unit. I decided to make “Happy Days”. I love her layouts but there are better ways to construct the units for the blocks. Can you see the Shaded Four Patch Units in the quilt above? Above is a deconstructed block using four Shaded Four Patch units. I absolutely love how using the background fabric for the narrow strip and the rectangle give you this pennant effect. By using Studio 180 Design’s Shaded Four Patch Technique Sheet and the Tucker Trimmer I was able to make oversized units and square them up perfectly. These little beauties are Combination Units made with my Tucker Trimmer I. When you put 4 units together it makes this great looking pin wheel for the center of the block. These are 2″ finished units. You can make these in 11 sizes with your Tucker Trimmer. The inner border was made using Quarter Square Triangles, which I made using my Tucker Trimmer. I Tuckerized the heck out of this quilt! Below are more blocks containing the Shaded Four Unit. These two blocks are made exactly the same, with the same fabric. The only difference is that the shaded Four Patch units in the corners are turned different ways. These blocks all contain Shaded Four Patch Units. 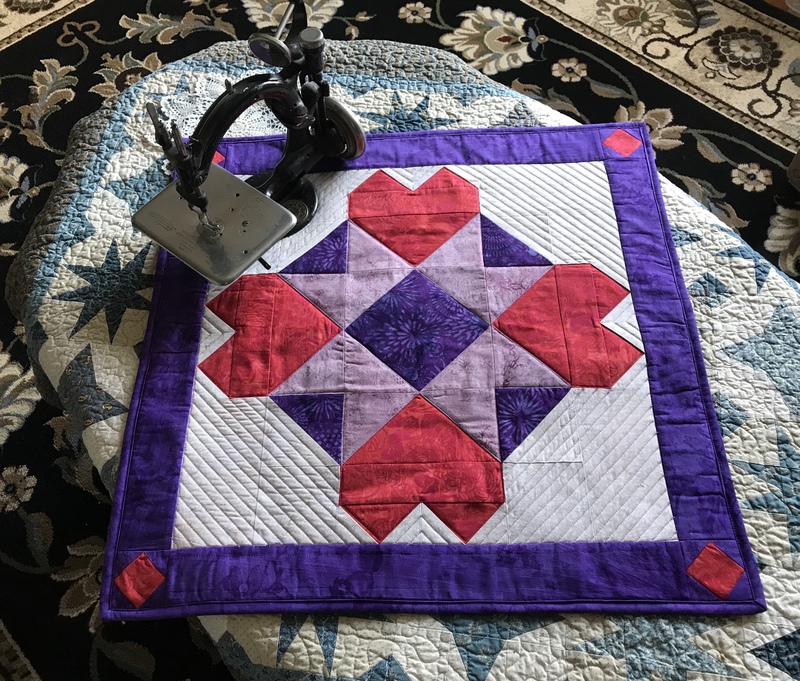 The quilt on the cover of “Love of Quilting” for Jan/Feb 2017 contains Shaded Four Patch Units and can be Tuckerized with your Trimmer I and Square/Squared tools. 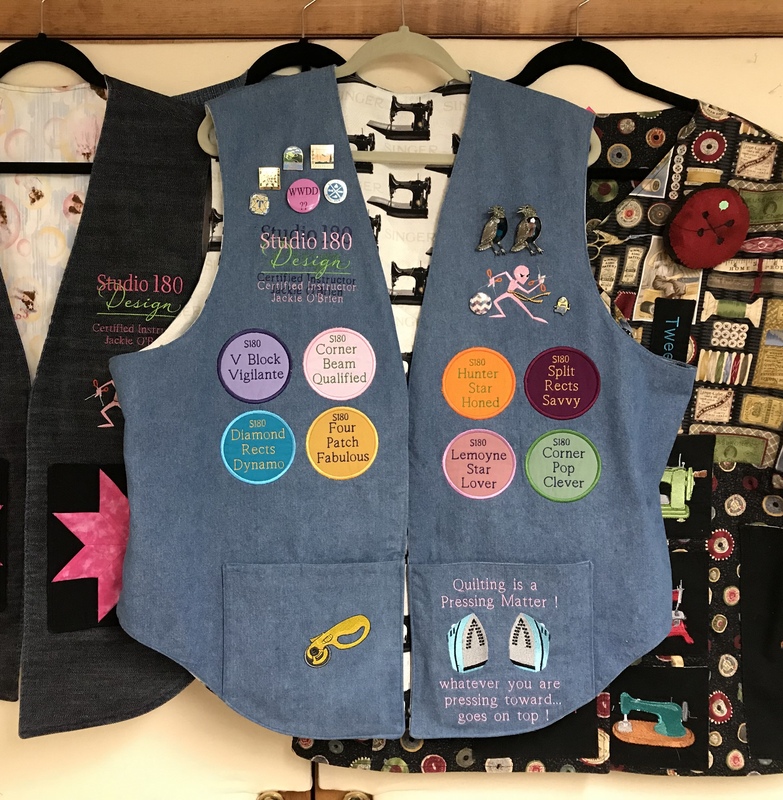 I would say Studio 180 Design Tools give you Quilting Clarity! This entry was posted in Shaded Four Patch, Square/Squared Tool, Studio 180 Design, Studio 180 Design Tools, Tucker Trimmer 1, Tuckerization, Wing Clipper 1 and tagged Deb Tucker, quilting, Quilts, Shaded Four Patch, Studio 180 Design, Tucker Trimmer 1, Tuckerization, Wing Clipper I on January 28, 2017 by ifthesethreadscouldtalk. I love Lemoyne stars, especially when there are no “Y” seams! I have wanted to make this pattern “Lucky Lemoynes” by Deb Tucker since it was released. 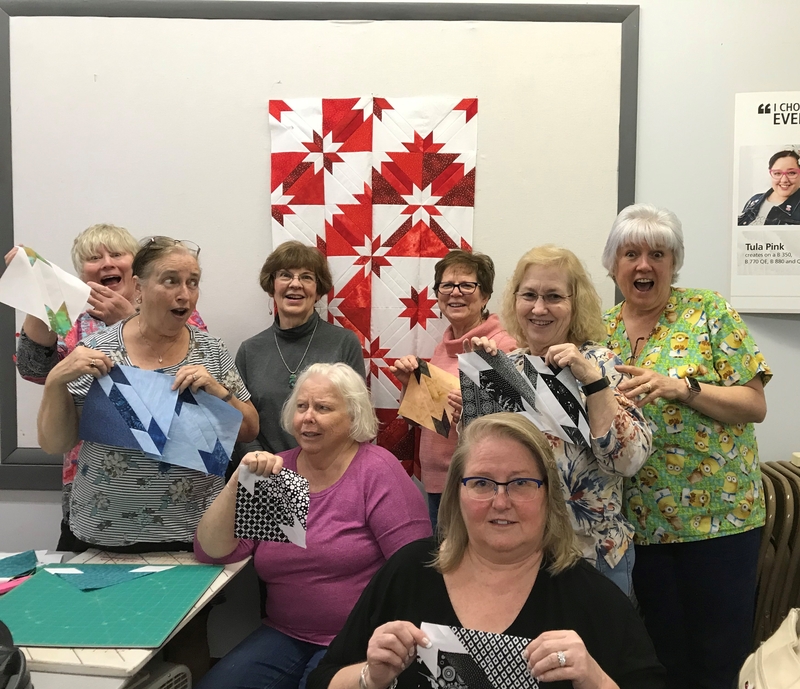 When you learn Deb Tucker’s process using the Rapid Fire Lemoyne Star Tool you will be able to make a Lemoyne star in 10 sizes from 3″ to 12″ blocks all by strip piecing and NO “Y” seams! I bought the fabric for it from Delve MIY (Make It Yourself) last August at the AQS show in Syracuse. The fabric is gorgeous. I chose their Plaster of Paris, Zuzu’s Petals & Daydreams IV – Love Blossoms lines. 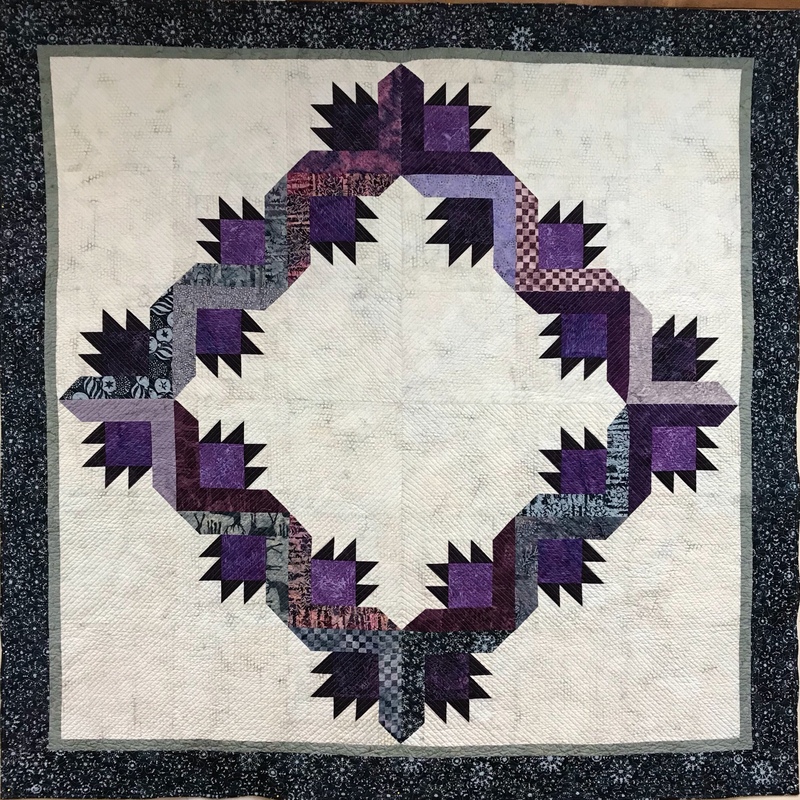 Lucky lemoynes is made with 7″ lemoyne star blocks and Shaded Four Patch units. Can you identify how the block is put together? Rapid Fire Lemoyne Star and Tucker Trimmer III tools are required fort this project. I wish I could get outside and get a better picture but the weather is not cooperating today. Carry on and quilt something! 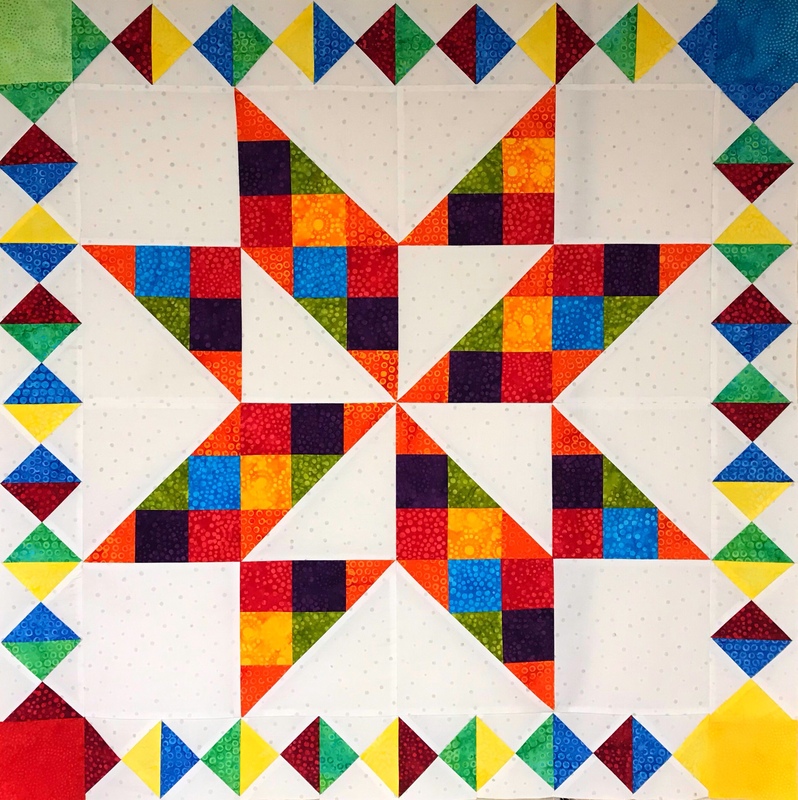 This entry was posted in Lemoyne Star, Shaded Four Patch Units and tagged Deb Tucker, Fronf Studios, Lemoyne Stars, quilting, Quilts, Shaded Four Patch, Studio 180 Design on January 27, 2016 by ifthesethreadscouldtalk.